If you missed SpareRoom founder/CEO Rupert Hunt’s, er, hunt for a pair of compatible roomies for his impossibly gorgeous 3,400 square-foot West Village loft with a 1,500 square-foot roof terrace last October, you missed a shot at being Rupe’s roomie for the completely unheard of total of one dollar a month for six months. Now the six months are up, and so is the $1 offer. 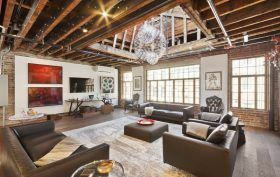 Take heart, though; the three-story loft at 305 Bleecker Street is just as amazing as it was in October, and it’s renting for the less shocking price of $40,000 a month–though we’ll assume that Hunt and his fortunate flatmates aren’t part of the deal.